The Indian Air Force had pressed into service its MLH class helicopter using Bambi Buckets, to contain the forest fire at Katra. The operations stared on the morning of May 24, wherein two helicopters, one each of the Daring Dragons and of Snow Leopards units, of the Western Air Command were launched. 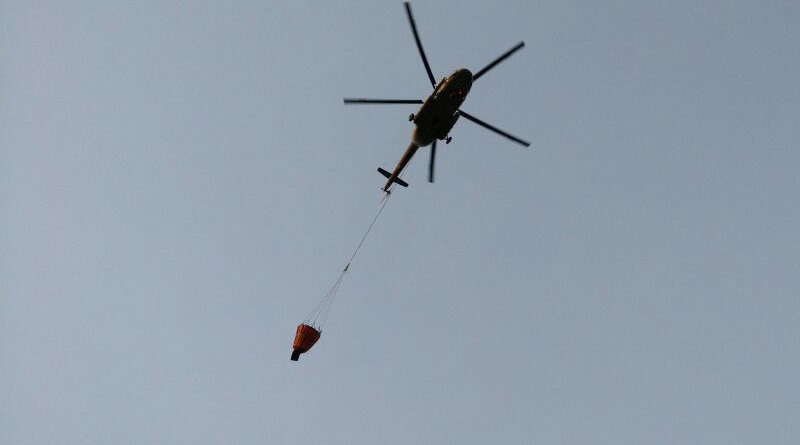 The helicopters filled in water from the Reasi water reservoir in the specially built Bambi Buckets which can carry approximately 2500 litres of water at a time. The first drop was done in the area of the new track from Ardhkuwari to Bhawan. “Its was a daunting task keeping in mind the challenging terrain and high tension cables in the area” said the captain of the lead aircraft Wing Commander Vikram. Operation of these types requires special skills by the pilot who flies with a very heavy load underslung. “We trained to respond to these types of situations whenever demanded. The operations are scheduled to continue through the day till the fire is contained” said Wing Commander Rahul the captain of the second helicopter.